Great posts so far. Particularly the breakdown style by Skam85. I am formulating my thoughts. I will post my manifesto soon! I only record F1 to see how Hartley goes,and as it looks like he will go at the end of the season that will save me 5mins of watching the race on high speed fast forward. You would be better off watching Nick Cassidy in Super Formula !! Stock front and rear wings - which are very basic indeed. I actually don't fully subscribed to the notion that F1 needs "Fixing", but instead "tweaking". Stock front and rear wings is a great idea. 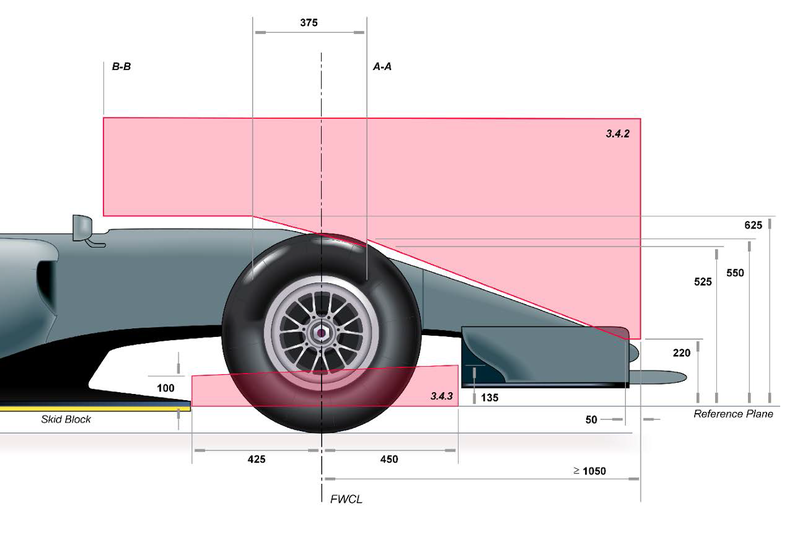 IMO the current F1 dimensional rules (like the below no bodywork zones) are an absolute mess, and that is why a wholesale overhaul would be great. I mean all these disjointed boxes (why are there jagged steps?) where you can and can't have bodywork, what a load of convoluted rubbish IMO! Trophy to chilibowl --- Genius!! F1 has been successful if the past with only a small number of engines possibilities. That would only work if you massively simplify the engine regulations, otherwise prospective manufacturers will look at what Honda have been up to, and run for the hills at the thought of spending hundreds of millions of dollars only to make themselves look very silly in front of a global audience. The move to hybrid or fully electric cars on the road means that any 100% petrol engine is going to look outdated and irrelevant to most manufacturers. Does that matter? To the race fan, probably no. The the prospective engine manufacturers - probably yes. Why not simplify the engine regulations, it would bring the costs down? The cars should be the pinnacle of design and speed within the global racing community. F1 should remain a competition of both constructors and drivers. So that means technology remains important. However, just as today, technical regulations should try to keep the teams within a box. I firmly believe that wide open “run what you brung” plus no cost controls is a recipe for disaster. I believe Bernie wanted F1 to be a glamour event. Movie stars, powerful people, movers and shakers, etc. to be walking through the pit lane. I think to a degree that is fine, but that should be the result of real popularity vs. artificial scarcity. Focus on race fans first. Make it cheaper to attend races. Don’t put the fans behind walls. Placing the races behind pay walls is just trying to squeeze the last few drops of juice out of a dying sport. If they care about the long term viability, do what you can to get young fans involved. That means free content and modern distribution platforms. A freemium model might work well. Ability to view the basis race for free, but pay extra for things like access to multiple in-car views, etc. Currently the teams have too much power. They should have a strong voice, but as it stands now they are a dysfunctional group that requires a nearly impossible consensus to get much if anything done. Additionally, the large manufactures wield way too much strength. Neuter them, even at the risk of them leaving. An absolutely nothing such as the current Ferrari veto. Permanent stewards to ensure consistency. 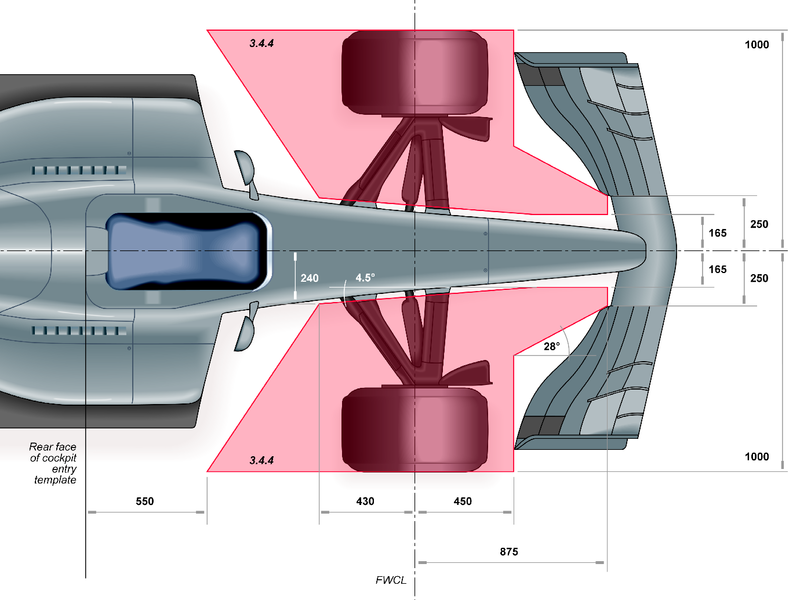 Create areas of exclusion to reduce downforce created by the upper body (including front and rear wings). But I think we should consider increasing (creating) the underbody wing if that can produce downforce that is less turbulent for following cars (not sure if this is doable). Stop using DRS. Open up the regulations around suspension design by allowing for active suspension. But, to prevent excessive cost, use a spec ECU just for the active suspension as well as a fixed number of sensors and actuators. The sensors and actuators could even be spec parts. This should result in more parity as it will rely upon improved software design (which should be cheaper) vs. costly and “trick” mechanical designs. I think the current suspension setups are overly complex because they are expensive and intricate mechanical watches trying to live in the age of cheap and accurate quartz watches. Other series already focus on pure electric. So I don’t think that is where F1 should go, but I also think moving to a pure hydrocarbon based ICE is also the not answer. I think the current regulations are very technically interesting, but also maybe too complex. The cost is just not sustainable and given the tall mountain that is required to be climbed by a new entrant, I think the height of the mountain needs to be lowered. So a less complex energy recovery system is a start. Allow customer cars in whatever way is required to make it work. I guess that means relaxing the amount of IP each team must own, but it has worked previously and I don’t see why it can’t work again. Thought will be required to prevent the creation of a firm two tier system. I hope that some of my chassis and aero suggestions may make it easier to create competitive cars. A single vendor with a small set number of compounds. I don’t like the idea of tire wars to “spice things up”. Tire wars is just an element of unpredictability used to disrupt a system that is stagnant. This may seem contrary to my comments above, but I think a limited set of compounds should result in making it harder for teams to optimize for every track. Find a way to allow for more testing. I am not sure how that can be done without creating exploding costs, but as it stands now, teams are jumping through hoops to test and validate in other way when maybe it might be cheaper to allow more track time. I know some large teams actually don’t want this. I think that is because they have gotten good as jumping through the hoops while they know the smaller teams don’t have the resources to do so. Basically keep the game expensive because we can afford to play it (see “Cost Caps” below). This is a touchy subject as many think it can’t be done. My opinion is that the larger and well-funded teams don’t want to try this because it might actually work. If the required level of funding to be competitive is pushed down and the ability to be funded remains roughly the same, then by definition more teams will be competitive and that the top teams will be less competitive in relation to the status quo. Are there difficulties in make this work? Yes, but I think with work it can be made successful. Generally speaking, this is going to result in a smaller workforce for teams. For those in the industry… sorry. As others have mentioned, I am fine with driver salaries being outside of the cap, or handled in a different way such as pooling a subset of senior management and engineering in with the drivers. Most importantly… As others have mentioned, a number of other high profile, high budget sporting series have figured this out. Lots of working models to use as examples. Profit Sharing, Prize Money, etc. The current system is extremely broken. I would replace it with one that does away with bonuses for historic teams (I am sure this would not be popular) and focus on a base distribution for all team with some bonus for finishing position in the championship. Even teams that finish at the bottom should be money, but there should be a mechanism prevent the F1 version of NASCAR’s “start and park” abuse. I’m not bothered about this. Back when F1 was good it wasn’t needed. Someone can make an exclusive great engine that is better in the same way they can make a superior chassis. Anyway, amongst all these calls of injustice, it isn’t even an issue. We are in a period where the power units are more consistent between works and customer teams than they have ever been. Maybe, occasionally, the works team get the new f spec engine first or something. So what? That’s there prerogative. Since, at least, the last few years of V8s most manufacturers, especially Merc, have produce identical engines for all. And the main reason? It is easier to do it that way. Ensure the cars can follow each other closely, without ruining their tires. I'm not an engineer so I cannot tell for sure how I would achieve that. Limiting front and rear wings and getting rid off all the aerodynamic add-ons like winglets could be part of the solution. But since I'm in charge, I'll get someone knowlegeable to advise me on this subject, someone like Gary Anderson. Introduce durable tires, get rid of the mandatory degradation. Bring 3 different compounds, teams can choose whatever they want. I'm not agreeing with myself yet if I want the teams to use 2 different sets or if they can race on a single set if they want to. There's no need for 224 people working during a pitstop. Limit the number of persons to 5: 1 for each tire and 1 lollypop man. This way we can actually SEE what is going on. Of course: if teams can run on a single set of tirs, there may not be much use for pitstops. Maybe we should keep the mandatory tire change? I would like the free broadcast to be in HD. If Blancpain, ELMS, IMSA can do that, then so can we. 4K, additional camera's, multiple screens etc ... can be left for paying viewers. Timing and scoring (incl. sector times) should be freely available, via a website (think: Better Live Timing / Live Timing Aggregator) and an app for those who prefer that. To me this is where the formula must go, the FIA must take the initiative and set the agenda, if the manufacturers walk away and the FIA have been crowing the importance of the expensive hybrid power units to the exclusion of all else, what is the fall back position?